Quite a promotion indeed for the last major French city before the Spanish border, which at first glance looks like little more than a fairly scruffy border town, where narrow medieval streets overhung with rows of laundry give way to large squares packed with outdoor market stalls. But scratch beneath the layer of dust that frequently covers the city—thanks to the Tramontane wind that blows from the northwest—and you will discover a world of seductive contrasts. Once Catalonia’s second city after Barcelona, Perpignan today still seems almost more Spanish than French—or at least more Catalan. Perpignan, or Perpinyá, as residents call it, lies on a plain where the Pyrenees flatten out to join the Mediterranean Sea. And although the former capital of the kings of Majorca and the counts of Roussillon was transferred to the French in 1659 under the Treaty of the Pyrenees, the Catalan heritage is still tangible everywhere. Yellow and red striped flags hang from every monument in the city, and all street signs are in Catalan as well as in French. A mouth-watering plate of tapas is commonly served with the local vin de pays, and even more telling is that locals are just as likely to dance the sardane—the Catalan national dance—as they are to play pétanque. 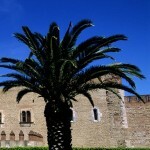 The mix of cultures in the city (population 105,000) gives Perpignan a wonderfully exotic flavor. Catalan, Romany, North African and European communities all live in relative harmony, much to the chagrin of Jean Marie Le Pen’s right wing Front National party, which claims that the town’s native white European inhabitants are being overrun by foreigners. Tell that to the throngs of young French bohemians who flock to the city to hang out in the convivial squares, which have filled up with chic cafés and bars in the recent years since the city underwent a massive facelift. Many of the main boulevards have also been widened to make room for pedestrian areas now lined with designer boutiques, elegant pâtisseries and ambitious restaurants. 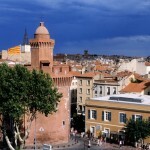 In fact, Perpignan has been a cultural and commercial crossroads since the Middle Ages. The city’s history dates back to the 10th century, and any tour should take in the many historic sites scattered around town, most of which can be reached on foot. Perhaps the first stop should be the striking red brick Castillet in the Place de Verdun—the crenellated tower gateway, a remnant of the city’s ramparts, is the emblem of the city, and now houses the Casa Pairal museum of Catalan folk arts and traditions. Built in 1368 by the kingdom of Aragon as a defense against the French, the Castillet later became a prison—there is a long-held legend that the body of a child found in a sealed wall in 1946 was that of Marie Antoinette’s son, the dauphin Louis XVII. A saunter through winding streets will take you to the tiny rue des Fabriques-d’En-Nabot, where the Maison Julia, a rare medieval private mansion, offers a patio with 14th-century Gothic galleries. Nearby, the Loge de Mer is another 14th-century building that once housed a maritime commercial tribunal; the Place de la Loge, adorned with a statue of Venus by Aristide Maillol, and the adjacent pedestrian street paved with pink marble are favorite gathering spots where in summer there is sardane dancing several times a week. A short walk leads to the Place Gambetta and the Catalan Gothic cathedral of Saint Jean, dedicated to the city’s patron saint John the Baptist, and the adjacent early 14th-century Campo Santo—a vast cloister-cemetery that is the only one of its kind in France. For the best views over Perpignan head to the Palais des Rois de Majorque, to the south of the city, where the Majorcan kings resided during their short reign from the late 13th to the mid-14th century. Work on the Moorish-influenced palace began in 1276 using local pink, white and blue marble and the overall effect is mesmerizing. In 1344 the city reverted to the kingdom of Aragon, and enjoyed a certain autonomy as part of the principality of Catalonia. 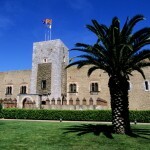 Later, under French rule, the palace was enclosed within the present citadel fortress. From the palace tower, on a clear day (and admittedly with the pesky Tramontane wind in your hair) you can see the Spanish border as well as the snow-capped Mount Canigou, the sacred mountain peak of the Catalans. It’s on Canigou that the flame is lit for the Festa Major, the feast of St. Jean that celebrates the summer solstice. Young people relay torches down from the peak to light fires in all the villages of Catalonia, where celebrations include music, laser shows, fireworks and the sardane danced around the bonfire. The trendy streets around the Castillet, with shops carrying famous name brands like Burberry and Kenzo, are a must for visitors who enjoy a little shopping à la française. The city also seems to have more than its fair share of beautiful boutiques selling every conceivable kind of footwear, from elegant Christian Louboutin heels to Ugg boots for kids, and of course local Catalan espadrilles, so shoe addicts beware. Those whose addiction is food should not miss the city’s main marketplace on Place Cassanyes, reached by meandering through the St. Jacques quarter—a fascinating area built on the slopes of the Puig des Lépreux (Lepers’ Hill). Once the Jewish quarter, it is now home to Gypsy and North African families and feels much more akin to Algiers or Marrakesh than to southern France. The Cassanyes market is open daily (it’s bigger on Saturday and Sunday) until about 1 pm, and there is little you can’t buy—the cornucopia includes local sausages, olives, spices, snails, cheese, bread and an abundance of locally grown fruit and vegetables. 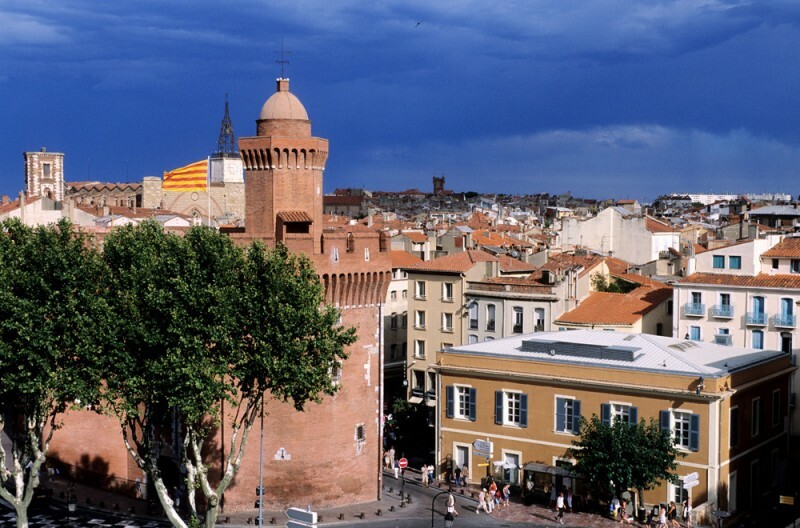 Perhaps Perpignan’s most irresistible attraction, though, is its vibrant nightlife and the everyday carnival atmosphere that goes hand in hand with its Catalan heritage. The central streets are lined with lively tapas bars serving such specialties as boles des picolats (beef and pork meat balls with olives and wild mushrooms) and red piquillo peppers stuffed with salt cod. Every summer Perpignan is transformed into a stage for the excellent Estivales festival, with an eclectic program of music, dance, drama and street theater. The second event that has put Perpignan firmly on the international culture map is the annual international photojournalism festival Visa pour l’Image, held every September, celebrating photojournalism from the earliest days of photography to today’s latest reportages. Festival-hopping or not, no visit would be complete without a look at Perpignan’s notorious railway station, situated at the top of Avenue Charles de Gaulle. Above the station is a monument in Dalí’s honor and across one of the main platforms is painted Perpignan Centre du Monde. There is also a luminous column topped by a laser beam dedicated to Dalí, whose painting The Railway Station at Perpignan features a glowing column and four shafts of light. The rail station itself, however, isn’t there. During the Middle Ages, the principality of Catalonia straddled the Pyrenees on the Mediterranean coast, an autonomous part of the kingdom of Aragon except for a “golden age”, 1273-1344, when it was independently ruled by the kings of Majorca. Later the region passed back and forth between France and Spain. Today, south of the Pyrenees, Catalonia is an Autonomous Community of Spain. On the French side, the pays catalan—roughly the old county of Roussillon and today the département of Pyrénées-Orientales—is an integral part of France. The Catalan language is similar to old Provençal and the langue d’oc.